Rub pork chops with salt and pepper. In 12-inch nonstick skillet, melt 2 tablespoons of the butter over medium-high heat. Add pork; cook 3 to 4 minutes or until browned on first side. Turn pork; reduce heat to medium, and continue to cook 2 to 3 minutes longer or until pork is no longer pink in center (at least 145°F). Transfer to plate, and cover with foil to keep warm. 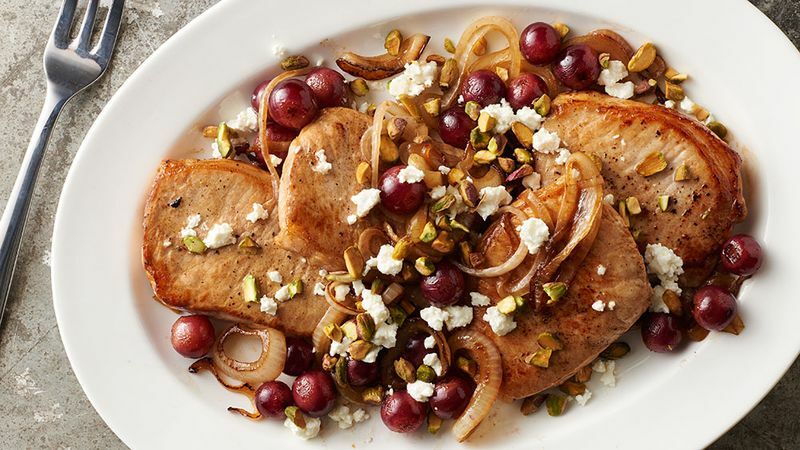 In same skillet, melt remaining 1 tablespoon butter over medium-high heat; add grapes and onion, and cook 5 to 7 minutes, stirring frequently, until onions soften and begin to brown on edges. Pour grape mixture over pork. Top with cheese and pistachio nuts. Experiment with the cheese and nuts. Manchego and walnuts would make fun substitutions. Round out this skillet dinner with a fresh mixed green salad.